It is no secret that the mining industry is energy intensive and most of the power grids are at the limit in providing power to existing mining operations. In order to remain competitive or expand operations, miners need to secure a reliable and affordable source of energy. 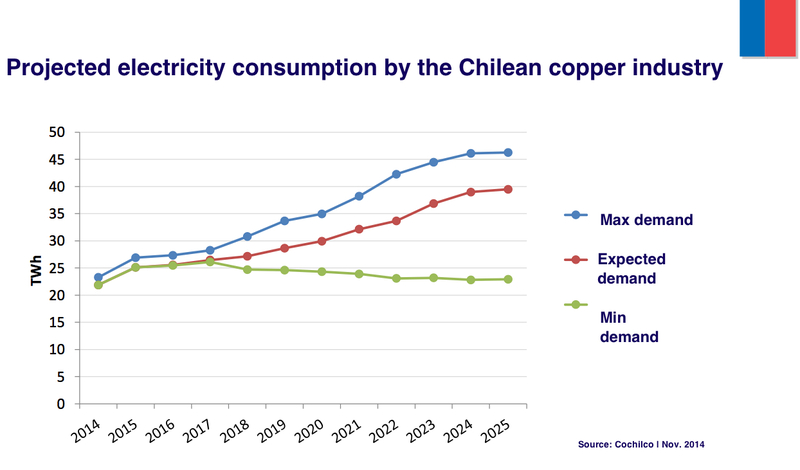 A good example of these energy struggles in the mining industry, is Chile. They are responsible for around a third of global copper output and as reported in Mining.com. Chile’s mining industry will nearly double its electricity consumption between now and 2025 as multibillion-dollar investments come to fruition. This information is based on an extensive report published by the state copper commission Cochilco. The report warns that Chile needs to urgently ramp up its installed power capacity by 18,000 gigawatts to meet future sectorial demand. The country’s mining sector energy operating costs represent roughly 14% of total production costs, equivalent to 27% per pound of metal, the highest level since 2000. Cochilco’s executive vice president, Sergio Hernández, said the electricity projects currently in the works are clearly insufficient to meet the future demands of the mining sector. He noted the current electricity generation portfolio would only cover around 40% of the mining sector’s electricity needs. Electricity costs in Chile have climbed 11% per year in the last decade, making it one of the most expensive places in the world to secure energy for mining projects. In fact, Chile’s mines pay twice as much for their energy as their peers in neighboring Peru. Fuel can account for up to a fifth of a mine’s operational costs. Chile is not the exception—all miners around the world consider energy one of the most important cost components that need to be controlled in order to remain profitable, especially now in times of low commodity prices. This has put more pressure in miners to secure reliable and affordable energy sources. That is why I think that miners will ramp up their investment in generating their own electricity mainly with traditional fuels and on a minor scale, with renewable sources. In order for these investments to pay off, miners will have to make sure these facilities are sustainable. This means that they would have to focus their efforts in energy efficiency. This means not only in complying with environmental regulations but also to prevent energy losses that can occur in many ways in a power generation operation. Some of these ways include leaks, venting, poor combustion and improper load allocation, cyclical loading of pumps and fans, and unnoticed equipment malfunctions. Also, miners will have to use more tools such as the Energy Advisor in order to monitor how energy is being consumed, and then analyze the information in order to take immediate action on over-consumption events. I think that this way they would be able to identify and prioritize energy saving projects in a consistent manner, as well as track improvement over time with targets and reports from areas they need to improve. Meeting energy demand will continue to be a struggle, but miners are growing more energy conscious, not just for environmental purposes, but because it makes business sense. From Jim: You can connect with other mining professionals in the Mining group of the Emerson Exchange 365 community. Posted Monday, December 15th, 2014 under Metals, Mining, Minerals. FOR EXAMPLE WHAT IS 514XP?